Throughout its history SSJD has had black Sisters. In the early part of the last century, several came from the U.S.A. where segregation prevented them from joining ‘white’ orders. Others were from Canada or the West Indies. Regardless of colour, these Sisters were treated like all others and undertook whatever ministries the Community required of them. 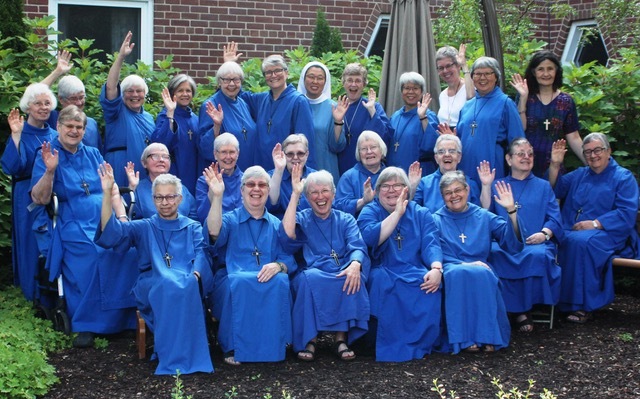 We profile some of these Sisters below. Sr. Frances came to us from the United States and was Professed in 1918. She had been a member of the Sisters of All Saints and St. Mary’s, an order of black nuns founded by the All Saints Sisters of the Poor. The Sisterhood disbanded in 1917. Here she is seen with Novice Joy. Sr. Marilyn and Mother Ruth, CHS. Sister Ruth came to us from the U.S.A. because she was not acceptable to the Community she wished to join because of her black heritage. She was Professed in SSJD in 1922 and then left the Community in 1952 to found the Community of the Holy Spirit in New York which she hoped would be a Community for those of different racial backgrounds. Sr. Frances and Sr. Ruth were both of Afro-American heritage although they both looked white. Sr. Constance came to SSJD in 1933 from Baltimore, MD, and was Professed in 1936. She has been in the Community for over 75 years and celebrated her 105th birthday this year. She has held many positions including being in charge of the Church Home and headmistress of Qu’Appelle Diocesan School in Regina. She received a degree in Gerontology in 1977. Here she is seen receiving an Honorary D.S.Litt from Trinity College in 1984. In 1997 she published her autobiography, Other Little Ships. Sr. Veronica, Professed in 1944, was very musical and taught piano to many children. Here she is seen with a group of children at St. Michael’s Mission in Montreal. Sr. Edna, Professed in 1949, was an art teacher in New York before she entered our Community and was very interested in art therapy. She loved teaching Sunday School and producing pageants with the children and, of course, continued doing art in various ways making posters and banners. Sr. Marilyn came to us from St. John the Evangelist Church in Montreal in 1948 at the age of 21 and was Professed in 1953. She had a keen and active mind and loved books. During her assignment in the library, she was known for being able to find whatever book was requested. Unfortunately she was diagnosed with MS in her late 30’s.